Garnish for the Girl Who's Got Everything! Someone must think you deserve your very own custom cocktail creation and I couldn’t agree more! In order to redeem your gift certificate for your very own Character Cocktail, please fill in your name, email address and the number on the upper right-hand corner of your gift certificate in the form, below, and press the submit button. Within 24 hours you will receive a questionnaire from randomactscomics@gmail.com that you’ll need to fill out for me so that I can get to know you a bit. Once you return that questionnaire, I’ll start work on your Character Cocktail and in 2 to 3 weeks your finished piece of cocktail art will be on it’s way to you! I’m so thrilled to be making this specially for you! Place your Order, making sure to use a valid email address as that's how step 2 is possible. 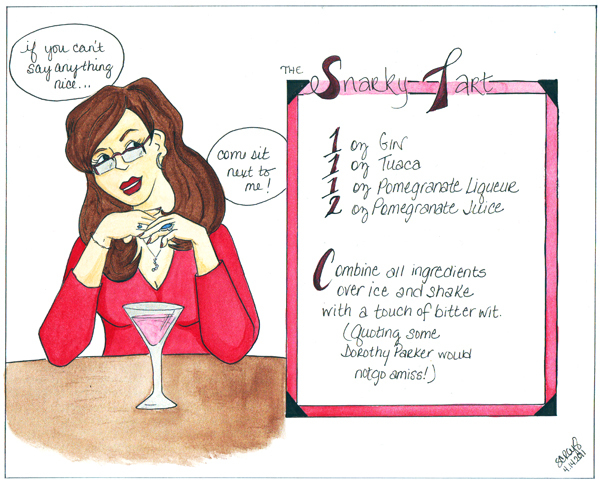 I create and test your custom cocktail recipe and create your cocktail art. Receive the "Congratulations, it's a Cocktail!" email complete with a snapshot of your finished drink and your art, which is now on it's way to you via USPS. Be the envy of all your girlfriends (optional, but fun! ).